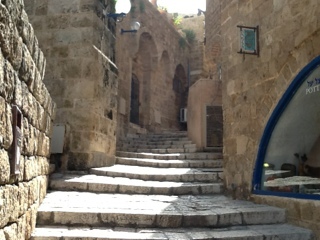 Karen's husband Matt accompanied me to the city of Old Jaffa on Wednesday morning. We walked along the paved walkway, south to Old Jaffa, which sits on a small promontory bluff above the sea. I didn't read all of the historical signs available, but I think that among the many peoples that have lived and controlled Jaffa in the past, the French are among them. This assumption is partly based on the fact that the historical markers used to point out important sites is a statue of a Napoleonic looking soldier. The soldier stands with his arm out, holding a sign that says Historic Site and something in Hebrew. Matt and I walked up and down the twisting alleys and steps throughout the morning, taking lots of pictures of the old stone walls, trees, doors, and things. It is a funny thing that tourists do--what might I think if someone walked into my yard, stopped, and took a picture of my front door for some reason? But I've never lived in a historic, picturesque, town on a bluff above the Mediterranean Sea . . .
At one point, Matt wanted to takes picture of an interesting tree that was down some steps within a courtyard. We met a woman at an art studio that immediately began talking to us and ushered us into her studio, closing the door. We learned that she was the daughter of the artist who began the studio--lots of silhouette imagery of Jews in traditional black clothing in front of white backgrounds. Some had a layered, 3D effect. The art was nice, I guess, but felt a bit too . . . immigrant? Not native or based on history? Something that was aimed at tourists possibly? Matt and I left after a few more minutes and continued our wandering. It was a beautiful, bright morning with cool breezes coming through the alleys at some spots to keep us cool. Matt and I then took a break, ate some fruit and nuts and drank water. We watched a family get some pictures taken by a fountain across the plaza where we sat. The fountain featured lots of kid-friendly, cartoonish characters, some with water coming out of mouths. Two of the teens were girls in the military, providing their mandatory service to the State. They were in uniform and one carried a rifle. I had been told it was not allowed to take photographs of the military, but Matt and I guessed that if they ask you--and seem to be off-duty?--maybe it's no big deal? On the way back to the hotel in Tel Aviv, we wandered through the shopping district, a bazaar-like maze of shops selling everything from second-hand furniture of all sorts, to shoes, tee-shirts, restaurants, restaurant-grade kitchen equipment . . . everything with no rhyme or reason. Everything is so non-corporate and individualized, it appears strange and haphazard to me. But it had a fun energy as well. Eventually, we made it back to the hotel, footsore and with aching legs. I went up to my room, got out of my sweaty clothes and lay down in the hotel bathrobe to nap and watch some TV. 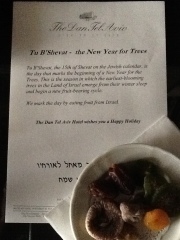 I dozed a bit and also ate fruit provided by the hotel in honor of the holiday being celebrated. It was a great first day. Today, as I write this, I am in the offices where Lynda has been working this week. After they have a few meetings, our group is being taken to Jerusalem for the afternoon. So much more excitement is yet to come and be described. Stay tuned!